KUALA LUMPUR (Sept 19): Astro Malaysia Holdings Bhd net profit for the second quarter ended July 31, 2014 jumped 39.29% to RM137.66 million against RM98.83 million a year earlier. Astro attributed the rise to higher earnings before interest, tax, depreciation and amortisation (EBITDA) of RM57.6 million and a decrease in net finance costs of RM19.1 million. However, Astro said this was offset by an increase in tax expenses of RM26.6 million, higher depreciation of set-top boxes of RM7.9 million and amortisation of software of RM3.9 million. Quarterly revenue expanded to RM1.35 billion, up 13.45% from RM1.19 billion previously, on increase in subscription to RM92.5 million, advertising of RM12.7 million and other revenue of RM55.6 million respectively. 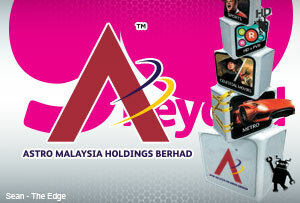 Earnings per share (EPS) was up 0.75 sen to 2.65 sen from 1.9 sen last year. The group also declared a second interim single-tier dividend of 2.25 sen per share payable on October 20, 2014. For the first half of financial year 2015 (1HFY15), Astro reported a net profit of RM265.99 million compared with RM212.97 million for the same period last year. This translates into EPS of 5.12 sen.
Revenue up 12.5% to RM2.6 billion from RM2.31 billion in the previous corresponding period. Going forward, Astro is executing its key strategy of growing revenues by providing differentiated content and a diverse range of value-added products and services. "To provide the best of content for our customers, we have scheduled a line-up of key sporting events including the Barclays Premier League (BPL) and Asian Games for the remainder of the financial year which should attract a good following amongst our subscribers," it said. "Our commitment to meeting the demand of local and regional viewers for original vernacular content is underlined by the recent collaboration with Pinewood Iskandar Malaysia Studios to offer world-class television content production services," it added. Astro said its strong TV viewership and radio listenership would give it greater reach and relevance to advertisers, underpinning its advertising expenditure (adex) sales. "Combined with the integrated media offering across TV, radio and digital media and a unique capability to engage with our customer, we expect our comprehensive marketing solutions to continue to grow Adex share," it added. With the launch of the M3B satellite, Astro said it would be able to introduce additional channels to appeal to a wider range of audience while supporting its growth initiatives. "We remain active managers of all our cost lines, with disciplined monitoring of our key cost drivers. The group maintains good visibility on its operating expenses, in particular content costs, with the significant majority of our key content contracts secured on a long term basis," Astro said.